White Curl Grubs can be responsible for a lot of damage occurring to lawns when they feed on the roots of the grass. The earliest damage will appear as patches of turf which seem to be dying off with an appearance of the drying out of the lawn’s leaf. As the damage progresses and the area enlarges in size, the lawn will be able to be pulled up from the soil. This occurs as the lawn area is severed away from it’s roots. There’s no doubt that when this type of damage begins occurring to lawns, it is usually at a high risk of dying. Therefore if White Curl Grubs are suspected they should be treated when they are discovered in numbers large enough for this damage to occur. These grubs are the larval stage of many different types of beetles including the African Black Beetle. They are most recognisable by being white and plump, with 6 legs, often with a small orange head. Their descriptive name continues as these grubs have an appearance of being curled up in the shape of a “C”. Due to their familiar appearance, many people often mistake these white grubs for Witchety Grubs, but they are not. One of the better ways to check for White Curl Grubs is to apply a layer on top of the lawn after the lawn has been watered for the day. This layer can be anything along the lines of a tarpaulin, an old carpet fragment, a hessian bag, a large piece of cardboard, newspapers or anything similar. Be sure to secure the layer so it won’t blow away. Leave the layer on the lawn overnight, and check it in the morning by lifting it up off the lawn. If White Curl Grubs are present, then they should appear beneath the layer when it is removed. The other way to check for White Curl Grubs, is to mix a very soapy bucket of water, and pour it over the lawn in an affected area. Keep an eye on the area for the next 10 minutes, and check for grubs coming to the surface. 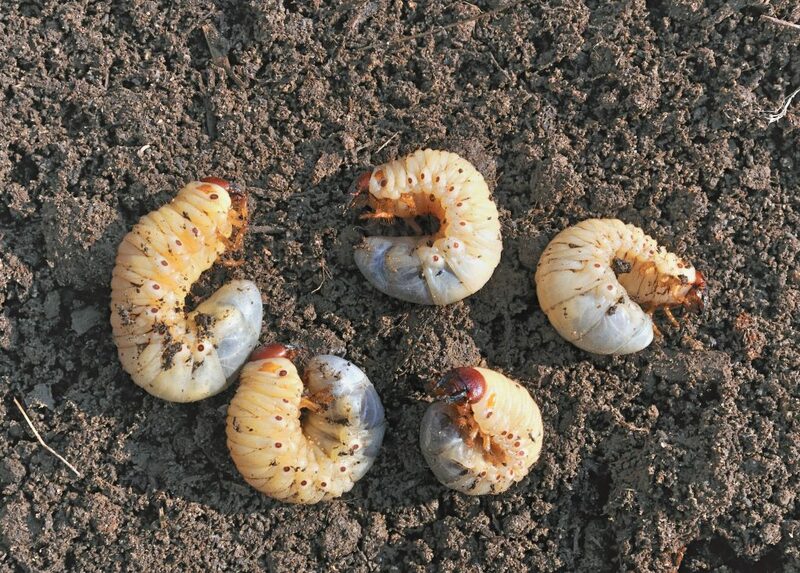 As the White Curl Grub is simply another type of Beetle larvae, the control of White Curl Grubs will be exactly the same as for any other Beetle infestation. This involves purchasing a Lawn Beetle and Grub Killer from the local nursery or gardening store, and following the directions on the packaging. In most cases this will involve sprinkling the pesticide granules over the lawn, followed by watering them into the soil. Quick action will be necessary to reduce the severity of any lawn damage for White Curl Grubs. Apply some quality lawn fertiliser at manufacturer’s recommendations, and ensure adequate water is applied to the lawn. If the damage is too severe and the lawn has died in the affected area, then allow more time for the warm season grasses to repair themselves, or re-seed the lawn in the case of cool season grass types.